This city was once the capital of the whole district and was still referred to in the beginning of the 19th Century as the “Kingdom of the Algarve”. 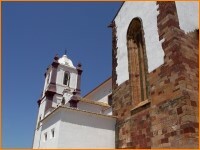 So much history is attached to Silves and its surrounding area that only a book would do it justice! Standing proudly on a hill Silves can be traced back to existing some 1.000 BC. Evidence shows that it was already a place of note in Roman times but it really became an important place during its occupation in the early 11th Century by the Moors. Giving it the name of Xelb, they constructed lavish palaces and created a cultural centre of learning for the whole Iberian Peninsular. Although it was important as a town it still fell under the mantle and control of Cordoba in Spain. They imported lions and other wild animals that are reputed to have roamed freely through exotic gardens in palaces under its Seville based powerful ruler Al-Mutamid. Born in Beja in 1040, he became at the tender age of thirteen the ruler of Silves until later when he moved to Spain. It is recorded that in 1189 there were over 15.000 inhabitants when the Knights of Santiago sacked the city with the assistance of the Anglo-Norman Crusaders. Two years later it was retaken by the Caliph Ben Yussef. It was only in 1242 that it was again under the control of the Portuguese Kings. From 1250 until 1267 and with the encouragement of Pope Innocent IV, the Algarve became a battle ground for its ownership between the Portuguese King Afonso III and the King of Castile. The matter was settled in the favour of the Portuguese by the Treaty of Badajoz. Silves continued in importance as a main town of the Algarve until its commerce began a slow decline in the 15th Century due the silting-up of the Rio Arade that had given the town good access to the sea. (The authorities are at present involved in re-establishing this important link by dredging the river). In 1544 the Bishop moved his residence to Faro. A specialty of the town are the “Morgados” cakes made with pumpkin. Most of the town and nearly all its ancient buildings were destroyed by the earthquake of 1755. The impressive remains of the castle dates back to Moors and there is a impressive underground water reservoirs that are still used by the city today. The biggest has the romantic name of “ Cistern of the Enchanted Moorish Girl” and was said to be a principal factor in the fall of the town during its siege. The Museu Arqueológico has been constructed above the cistern and here a visitor will find exhibits of locally found objects included items from the Stone Age. As a reminder of the Romans occupation is the Ponte Romana, a fine strong bridge over the Rio Arade below the city walls and having been rebuilt from the original in the 15th Century. 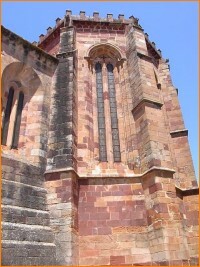 The city’s earlier 13th Century Cathedral was built on the site of a Mosque and has suffered considerable alteration over the centuries. To the southwest side of the town is a modern statue celebrating the siege of 1189 in an appropriately named square, Largo dos Mártires, where it is suggested that the remains of the defending Moors were buried. Just to the northeast of the city is a fascinating 16th Century granite cross that is located beside the road to the north. 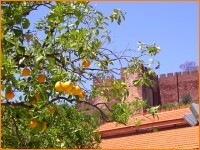 The countryside around Silves was once the biggest orange growing area in Portugal and the local quality of this fruit still enjoys fame over other areas in Portugal and neighbouring Spain. 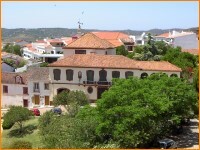 There has been a popular recent decision to site a new University in Silves to recreate its links with its past. Another administrative and rural town named Lagoa is only 8 Kms. to the south of Silves. To the southeast is the town of Alcantarilha whose main claim to fame is a chapel lined with hundreds of bones belonging to its earlier inhabitants. Further to the south of Alcantarilha is the beach town of Armação de Pera with its long beautiful sandy beach. Lying to the north of the fertile valleys of Silves is an area of attractive forest covered hills that eventually lead up to the mountains of Monchique. The large national Dams of Arade and Foz are well worth visiting for the beauty of their natural setting.